View the first of the new four magic moves to a winning golf swing. Andy Brown from St Andrews "The Home Of Golf", Scotland explains how the early backward wrist break is your answer to lower golf scores and straighter and longer shots. This video shows how you can dramatically cut 7 to 12 strokes from your handicap and have the perfect golf swing. It is a must watch for any golfer. Download the accompanying free 60 page PDF report and 19 minute audio from http://www.GolfSwingSecretsRevealed.com. Hi my name is Andy Brown from http://www.GolfSwingSecretsRevealed.com and in this video I would like to talk about the first of the four magic moves. If you have read the free golf swing report or have listened to the audio I give away on the site you will already know that the first magic move is one where you must start the backswing with an early backward wrist break. And as the backward break is one of the key points - I want to be absolutely certain you understand what I mean. First, hold your right hand in front of you, fingers together and extended, thumb up and the palm squarely facing to the left. From that position bend the hand to the right, trying to make the fingers come back towards the outside of the wrist. You won’t be able to get them anywhere near the wrist, but a person with supple wrists can bend the hand back until they form a right angle. I’m almost there as you can see. Quite simply this straight back motion of the hand is the backward wrist break. The right hand moves towards the outside of the forearm with no turning or rolling. In Chapter 3 of the report I give away on my site I go into great detail about the perfect golf grip. One that stipulates that at address one is showing only two knuckles of the left hand and one of the right hand. The right hand must be placed on the club so that the left thumb lies right down the middle of the right palm. This brings the heel of the right hand against the big knuckle at the base of the left thumb. To make the backward wrist break we merely push the heel of the right hand down against the big knuckle of the left thumb. You must place a downward pressure of the heel onto the thumb. When it is done, without moving the hands otherwise, the right hand breaks backward at the wrist and the left hand breaks inward, the back of the left hand going under and facing towards the ground. 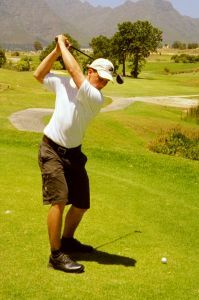 Golf Backswing: Backward movement of the golf club. Awful results: Slice, pull, smother, hook, scuff, or shank. Magic move: Early backward wrist break, with thumb press. Check points: One knuckle of left hand visible, two of right hand, and none of club face when hands are hip high. Ready to learn about the golf backswing? In this section you'll learn to start the swing, uncover the first fatal flaws that appear (with the horrible shots they produce), and learn the first of the magic moves that will cut strokes from your score. Ironically, these first flaws that creep into average players swing produce an effect that is the exact opposite of what they want. Just as you have, they have read and heard all their golfing life that certain things are essential. The first of these is that you must pivot, the second is that the club must be taken away from the ball inside the projected line of flight, the third is that the wrists should be broken late and upward. Now let's see what happens when you put them into practice. First, you twist your body as you start the take-away. This brings the club back on an inside line. Fine. It opens the face of the club too. Excellent, you say, for you know it should be open at the top of the swing. You delay the wrist break as long as possible and then let the wrists break upward. Then what happens? The very thing you wanted most to avoid. You hit the ball from the outside in, with an open face (usually), and you get an outlandish slice. If you close the face on the downswing you probably will get a pull, or a smother (if it's closed too much), or a hook. If the club is outside the line far enough, you will even get that most horrible of all shots, a shank. You are then thoroughly crestfallen. You have done everything you'd been told to do and you still hit those awful shots. Why? You hit them because your early movements got you into such a position at the top that you could hardly hit anything else. Your early pivot, your attempt to "turn in a barrel," didn't permit you to transfer your weight to your right leg. You kept too much of it on your left leg. Taking the club away inside (it was probably quite sharply inside) got it moving too flat, as well as opening the face. Then, to get the swing farther along, you had to bring the club up. At that point things began to get tight and uncomfortable. To ease them you stopped the turn that your shoulders were making and let your left wrist collapse, or bend back and go under the club. This let you raise the club and get what you felt was a full swing, without being uncomfortable. The face of the club, of course, was wide open at the top. What happened next was inevitable. You started the downswing by regripping with your left hand, which had loosened, which made you get the club head started moving too soon. Your weight, being mostly on your left leg, moved back to the right leg. You turned your hips and shoulders sharply, which threw the club onto the outside-in line you were trying to avoid. And you came down across the ball. Chances are that as you did, your left knee snapped back and locked and your right knee bent straight out in front of you. And your follow-through, what there was of it, carried the club around you instead of up and out after the ball. You, however, see none of these things as the cause of your bad shots. You feel only that you haven't done well enough what you are trying to do, and in your efforts to meet the standards, you exaggerate the actions. You don't improve. You may easily get worse. And you finally end your practice session frustrated and dejected, or your round, if you are playing, with a shameful score. How can you, then, improve your golf backswing? The way the right hand should move from the wrist in the early backward break—straight back toward the outside of the forearm, with no turning or rolling. In part 1 of the golf backswing section of this site, we discussed some of the flaws that plague a golf player's swing. Fortunately, there is a cure for all this, a cure that is almost miraculous. What is the magic secret? Start the golf backswing with an early backward wrist break. Of course this sounds too simple to be true. It violates every rule you ever heard about starting the golf swing. But it is true — and unless your swing is now everything that you want it to be, you will find out how and why this magic move is made. Since the backward break is one of the key points in our system, let's be absolutely certain you understand what it is. First, hold your right hand in front of you, fingers to-gether and extended, thumb up and the palm squarely facing the left. From that position bend the hand to the right, trying to make the fingers, come back toward the outside of the wrist. You can't get them anywhere near the wrist, of course, but a person with supple wrists can bend the hand back until hand and wrist form a right angle. The standard wrist break is quite different. Hold your hand again as you held it before. Now, instead of bending it backward, bend it up, so that the thumb comes toward you. That is the orthodox, accepted wrist break. Forget it. You will get it eventually, but you don't want it now. You will remember that the grip we stipulated was one which, at address, showed only two knuckles of the left hand and one of the right hand. thumb lay right down the middle of the right palm. This brought the heel of the right hand against the big knuckle at the base of the left thumb. Click on the part 3 link below to learn how to use your thumbs when executing the golf backswing.